Gluu Server Community Edition supports the System for Cross-domain Identity Management (SCIM) version 2.0 out of the box. To enable SCIM open the oxTrust administration interface and navigate to Organization Configuration > System Configuration. Find SCIM Support and select Enabled. 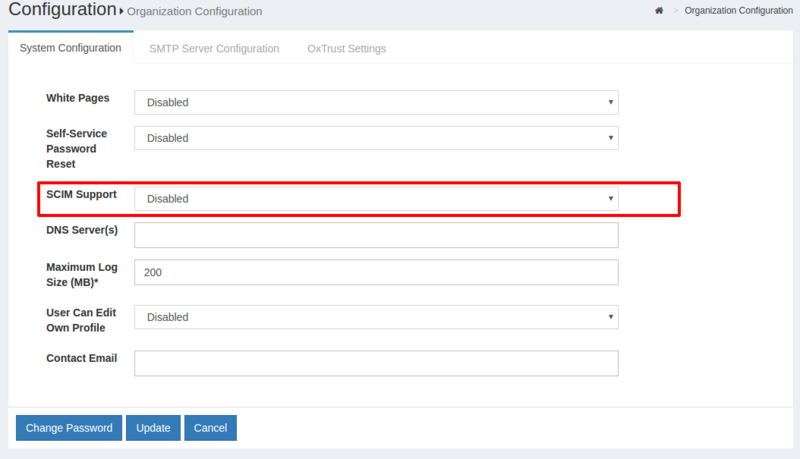 Then enable the protection mode you want for your API, see details here. In this section we provide a conformance matrix where you can see which features from the spec are supported by Gluu implementation. To learn about the specific capabilities of the service, inspect your /ServiceProvider, /ResourceTypes, and /Schemas endpoints (see below). These endpoints are not protected so you can use a web browser to check. !!! Note: Actual endpoint URLs are prefixed accordingly with the root URL of SCIM API. As an example, the user's endpoint URL to use in your applications should be https://your.gluu-host.com/identity/restv1/scim/v2/Users. SCIM 2.0 is governed by the SCIM:Core Schema and SCIM:Protocol spec docs. The latter contains full details about the API structure, so use it as a reference in your development tasks. Unless otherwise stated, all endpoints are protected via UMA 2.0 or test mode. All payloads sent to endpoints using POST or PUT should be supplied using Content-Type: application/scim+json or application/json, and using UTF-8 encoding. Liwewise, output is sent from server in UTF-8. The following table lists characteristics of SCIM protocol (see section 3 of RFC 7644) and correlates the level of support and conformance provided by Gluu Server implementation. Search users based on filter criteria (see section 3.4.2 of RFC 7644). Output data is in form of a ListResponse. Resources returned belong to User. Status code 200 is returned for a successful response. Creates a user (see section 3.3 of RFC 7644). The representation of the user created containing the attributes whose returnability is "default". This can be overriden by supplying attributes or excludedAttributes query parameters (see section 3.4.2.5 of RFC 7644). Status code 201 is returned upon successful operation. Search groups based on filter criteria (see section 3.4.3 of RFC 7644). Returns a user by id (see section 3.4.1 of RFC 7644). The user requested containing the attributes whose returnability is "default". This can be overriden by supplying attributes or excludedAttributes query parameters (see section 3.4.2.5 of RFC 7644). Status code 200 is returned upon successful operation. If the id supplied as part of the URL does not map to an existing user, then 404 is returned. Updates a user (see section 3.5.1 of RFC 7644). For payload data, it's not necessary to provide the whole User representation. Partial data suffices, that is, a Json object that contains the attributes to be replaced in the destination. The representation of the user (after the update) containing the attributes whose returnability is "default". This can be overriden by supplying attributes or excludedAttributes query parameters (see section 3.4.2.5 of RFC 7644). Modifies a user (see section 3.5.2 of RFC 7644). The representation of the user (after modification) containing the attributes whose returnability is "default". This can be overriden by supplying attributes or excludedAttributes query parameters (see section 3.4.2.5 of RFC 7644). Deletes a user (see section 3.6 of RFC 7644). A no content response (status code 204) if the operation was a successful. If the id supplied as part of the URL does not map to an existing user, then 404 is returned. Search groups based on filter criteria (see section 3.4.2 of RFC 7644). Output data is in form of a ListResponse. Resources returned belong to Group. Creates a group (see section 3.3 of RFC 7644). The representation of the group created containing the attributes whose returnability is "default". This can be overriden by supplying attributes or excludedAttributes query parameters (see section 3.4.2.5 of RFC 7644). Returns a group by id (see section 3.4.1 of RFC 7644). The group requested containing the attributes whose returnability is "default". This can be overriden by supplying attributes or excludedAttributes query parameters (see section 3.4.2.5 of RFC 7644). Status code 200 is returned upon successful operation. If the id supplied as part of the URL does not map to an existing group, then 404 is returned. Updates a group (see section 3.5.1 of RFC 7644). For payload data, it's not necessary to provide the whole Group representation. Partial data suffices, that is, a Json object that contains the attributes to be replaced in the destination. The representation of the group (after the update) containing the attributes whose returnability is "default". This can be overriden by supplying attributes or excludedAttributes query parameters (see section 3.4.2.5 of RFC 7644). Modifies a group (see section 3.5.2 of RFC 7644). The representation of the group (after modification) containing the attributes whose returnability is "default". This can be overriden by supplying attributes or excludedAttributes query parameters (see section 3.4.2.5 of RFC 7644). Deletes a group (see section 3.6 of RFC 7644). A no content response (status code 204) if the operation was a successful. If the id supplied as part of the URL does not map to an existing group, then 404 is returned. Search fido devices based on filter criteria (see section 3.4.2 of RFC 7644). Output data is in form of a ListResponse. Resources returned belong to FidoDevice. Search fido devices based on filter criteria (see section 3.4.3 of RFC 7644). Returns a fido device by id (see section 3.4.1 of RFC 7644). The FidoDevice requested containing the attributes whose returnability is "default". This can be overriden by supplying attributes or excludedAttributes query parameters (see section 3.4.2.5 of RFC 7644). Status code 200 is returned upon successful operation. If the id supplied as part of the URL does not map to an existing fido device, then 404 is returned. Updates a fido device (see section 3.5.1 of RFC 7644). For payload data, it's not necessary to provide the whole FidoDevice representation. Partial data suffices, that is, a Json object that contains the attributes to be replaced in the destination. Take into account the mutability of attributes for this resource (check the /Schemas endpoint). For security reasons only a few attributes are allowed to be modified. The representation of the FidoDevice (after the update) containing the attributes whose returnability is "default". This can be overriden by supplying attributes or excludedAttributes query parameters (see section 3.4.2.5 of RFC 7644). Deletes a fido device (see section 3.6 of RFC 7644). A no content response (status code 204) if the operation was a successful. If the id supplied as part of the URL does not map to an existing fido device, then 404 is returned. Applies bulk operations (see section 3.7 of RFC 7644). A BulkResponse with details of every attempted operation. The shape and size of the response depends heavily on the value of "failOnErrors" found in BulkRequest (see spec). Status code 200 is returned upon successful operation. Every operation result in BulkResponse contains at the same time its own status code. Search resources based on filter criteria (see section 3.4.3 of RFC 7644). Output data is in form of a ListResponse. Resources returned belong to Resource. There are three endpoints that facilitate discovery of features of the service itself and about the schema used; in other words, service metadata. Please check section 4 of RFC 7644 for more information. Information about the capabilities of the server in Json format as decribed in section 5 of RFC 7643. Information about the types of resources available in the service (e.g., Users and Groups) in form of a ListResponse. It's possible to request the information for a single resource type by adding a resource name suffix to the URL, for instance /ResourceTypes/User for users. In this case, a json is returned according to section 6 of RFC 7643. Retrieves the schemas in use by available resources (and which are accepted by the service provider). Output data is in form of a ListResponse, however it's possible to request the information for a single resource type by adding a schema URI suffix to the URL, for instance /Schemas/urn:ietf:params:scim:schemas:core:2.0:Group for schema info about groups. In this case, a json is returned according to section 7 of RFC 7643. Inspect the contents of the /Schemas endpoint. Use a browser for this (none of the service provider configuration endpoints are protected).